Comedian Rhea Butcher is having a whirlwind of a year. 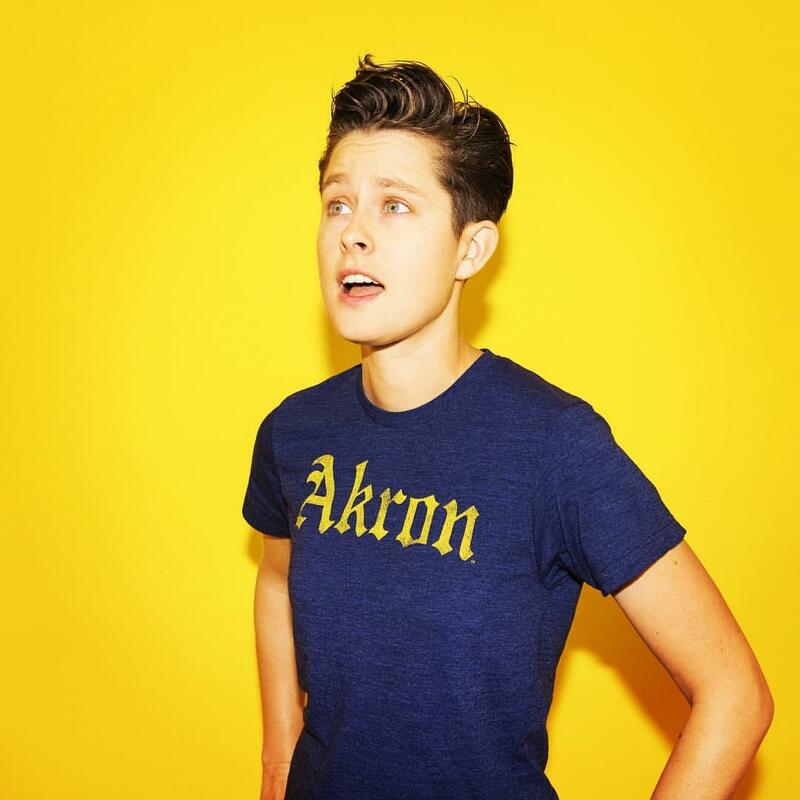 The 34-year-old Akron native has appeared on Conan O’Brien, launched an online TV series called “Take My Wife” with her wife and fellow comic, Cameron Esposito, and has had the No. 1 comedy album on iTunes for the past week. Still, at the center of her success is her love for her hometown. Butcher opens her stand-up shows with something like this: "My name is Rhea Butcher; it's not a fake name. It's funny because it's true. I am butcher than all of you." She explains why, as a lesbian, opening that way matters. "The moment we've been in, in the gay rights movement, I just like talking about it because all the artists and people I've been drawn to and inspired by in my life have always talked about it. "Having that joke up top also does this trick of sort of disarming the audience because most of the time people have not known who I am. I know it's a ridiculous name. It's also a ridiculously-perfect name." Butcher's shows are also filled with sharp jokes about sexism in sports (she plays baseball, not softball), her appearance and gender roles (she says she's often mistaken for a young man by flight attendants) and her struggle to come out as a lesbian. "It's what's important to me and it's what I think about. I grew up watching women stand-ups. If you can get somebody who disagrees with you to laugh about something, they're probably going to agree with you, eventually. Or you can at least talk to them about it and make them less angry." "I wouldn't be the person I am if I wasn't from Akron." Butcher and her wife, fellow comedian Cameron Esposito, launched a scripted TV series this month that streams on NBC's Seeso. It's the mostly true story of their relationship and first year of marriage navigating their careers in Los Angeles. "It's kind of wild because we pitched the show in the end of last year and we were also planning our wedding; we got married in December. So basically we were touring, pitching and planning all at the same time." The show opens with Butcher working for a graphic design company, contemplating making comedy a full-time career. "For like two years, I had a full-time day job where I worked from 7 a.m.. to 7 p.m. and I would go out and do stand-up at night. In the summer of 2014, I just couldn't take it anymore. I quit. And it was, I believe, the same week that LeBron [James] said he was coming back. I think it honestly inspired me to be like, 'I can do this!' I still am like, 'Am I doing this, for real?!'" Butcher grew up in the Kenmore neighborhood of Akron. She graduated from the University of Akron. She wears her pride literally on her sleeve -- she's usually wearing an Akron or Ohio-themed shirt, or an Indians hat or Cavs jersey. "I really feel the same way that LeBron feels. It's the city that made him. And I have been inspired by him, too, because I knew and-or thought, 'I gotta get out of Akron to make it.' And, in some ways, totally, because if you want to be a stand-up comic you have to go to where stand-up comedy is. But for that reason, I think that's why I love it here so much because I wouldn't be the person I am if I wasn't from Akron. "I say this all the time -- and it's a compliment -- it's just so weird here. I love how everybody has this different sense of humor. It's like sarcastic and also semi-humble and just very dry. I just love this city and how nobody takes themselves too seriously, but also has so much pride in their city. There's a lot of positive things going on." Butcher says she's hopeful "Take My Wife" gets picked up for a second season and she's looking forward to touring more with her comedy and promoting her new album. For now, she's focusing on the strike zone. She's throwing out the first pitch at the Indians game on Labor Day, something she calls a dream. "2016 has just been a really fun year," she says. "It feels like we won. I mean, [the Cavs] did win. But it feels like we got to win a little bit and it feels nice."